On the 24th Friday mid-morning. I took a walk to the Prettyboy study area with my hubby and his sister. It has a been a busy week with my SIL visiting from Washington State. But we still took some time to enjoy nature and its simple pleasures and to help with the bird study. It was a pretty sky and the weather was wonderful. I enjoyed the blue sky and puffy white clouds. I read that they can live in a variety of differnt habitats they are most abundant in moist FORESTED areas. I am helping my bird club by taking my walks to the study area at the reservoir near my home. They are doing the study to see if the tree cutting has an effect on the birds especially the breeding birds. There is a record of the birds known to be in the area and the study over the time period will show what birds continue in the area and if any new birds appear. 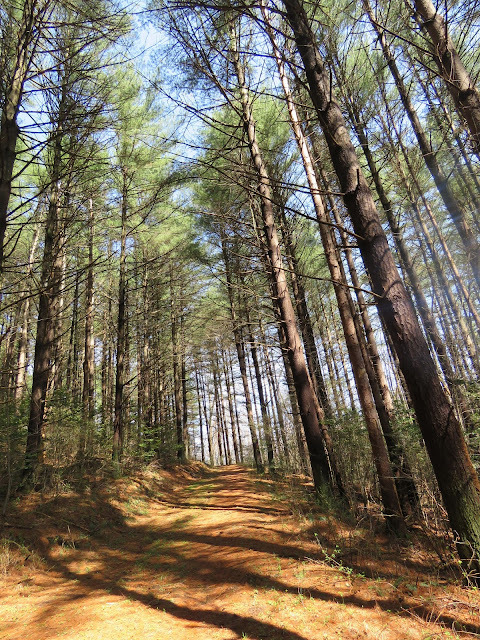 There are three areas included in the study....one area is where the trees where just thinned, the next area is the treed area or the edge around the clear cut and the last area is the clear cut area itself. I included the birds seen and heard at my house and yard because it borders the reservoir and the birds should be the same birds seen and heard at the study area. One bird I was hoping to hear or see around the study area was the Wood Thrush but during all my visits to the study area I have not even heard one. Luckily I am still hearing at least two in the woods next to my yard. We have been seeing these roses growing next to the fireroad near the clearcut area. Maybe more sunlight in the clear cut area is helping these pretty flowers grow. It could be these roses are re-appearing when they were actually growing around the farms and houses on this land before the city acquired the land for the watershed protection around the reservoir. The walk and birding took place from 10:15 to 11:30 on Friday. I have listed the birds I saw in the trimmed area off the fireroad and the clear cut area and the edge of the clearing. I also had a nice view of the moon with the white puffy clouds at the clear cut area. Indingo Bunting... while I was there 10:15-10:45. Maybe it was slow due to the time I was there? Back at my yard the birds seen in my yard and in the reservoir property next to my yard. These are scenes and sky shots from my walk, I hope you enjoyed them. To see more please visit Michelle's Nature Notes and to see more skies from around the world please visit Skywatch Friday. Thanks to Michelle at Rambling Woods and thanks to the gang at Skywatch Friday: Sylvia, Wren, Sandy and Klaus. Also thanks for stopping by to see my post, I hope the rest of your week and the weekend is wonderful. Take some time to enjoy nature and it's simple pleasures. pretty indigo! and love that orange-trimmed box turtle. SO cute! You have such a knowledge on the ID of birds. I love your pictures and your long list of bird sightings. It will be interesting to know how the clearing will affect the birds. What a shame about the clearing. It's great that you are helping with the study! Hope you have been having a great time with your guest! So many beautiful images! How wonderful of you to help with the study. I hope your results show that the birds are still thriving in the area. Love the Eastern Box Turtle! Another thoroughly enjoyable post Eileen, so interesting to read and your photos are always great. You live in a beautiful area. Great post, Eileen. Love your header image, such gorgeous colors. Beautiful Box Turtle - I don't think I have ever seen one. Gorgeous landscapes and skies! That is a pretty pink rose; it looks as though it is shaped perfectly. Your sky and puffy cloud pictures are so pretty. We could use a little bit of the sunshine today. It is an OK day, but more sun would be better! Great shots of the turtle and I very much like your collage. This was a delightful collection of nature photographs. I love the pattern on the turtle's shell. Wow! A great count -- and a lovely walk -- I believe that reservoir is well-named! Your mosaic is absolutely charming. It looks as if it should illustrate a wonderful children's book about nature. Just beautiful pictures. I am so jealous that you have INdigo Buntings. love the rose...and the turtle...but that center one of the forest path is my favorite I think. you have so much diversity in your place, love the pictures. What a wonderful walk, and beautiful photos. I don't know much about birds, but I always love seeing them. I have enjoyed the walk with lovely blue skies and beautiful scenery. I can almost hear the tweets, chirps and songs of the birds you have described. A lovely walk in the woods, Eileen. Thanks for sharing your notes with us. I had no idea that the box turtles were a species of concern. As a child in Virginia, we had them in the woods behind our house all the time. Those woods are a perfect example of the habitat loss and fragmentation that's causing problems. I could once walk for miles back to a national park. Now I can see the next subdivision from the porch at my parents' house. I'll say it again....I'm so jealous!! The only thing that is remotely 'winged' in our neck of the woods these days are mosquitoes!! And you know what they say about Texas having everything bigger....the skeeters'll take you midair if they are allowed!! Loved the indigo bunting atop the tree!! Excellent. I had just heard a news item about turtles crossing a runway at JFK to lay their eggs, when I read this post. I thought double turtle articles was an interesting coincidence! You have seen some beautiful clouds, birds, and flowers this week! Great post and series of photos. Love the turtle. i enjoy all your nature photographs especially the rose and the turtle. the sky is wonderful. Happy skywatching. Wow you are surrounded with beautiful creatures. Great shots Eileen! A beautiful series of shots! Absolutely gorgeous captures for the day, Eileen! Such beautiful skies and flowers and I do LOVE the turtle! Hope you have a lovely weekend! Enjoy! have a wonderful 4th of July holiday. Such lovely captures. Love the place. Great nature photos...I wish I were more knowledgable about birds. Hi Eileen, You sure are enjoying many birds visiting! I like that picture of the turtle. I once briefly had a turtle as a child. My father found it in Los Angeles of all places! Wildlife thrives in unexpected places, doesn't it? Have a super nice evening tonight and a wonderful Friday tomorrow! Wonderful set of shots. Love the birds and turtles. Eillen, sometimes, I walk, alone, in the forest...And I stop to hear the voice(?) of birds and I really surprised me because we can learn many things with them. I adored to read what you´ve written. wow!! birds! clouds! birds! wild roses! more birds! 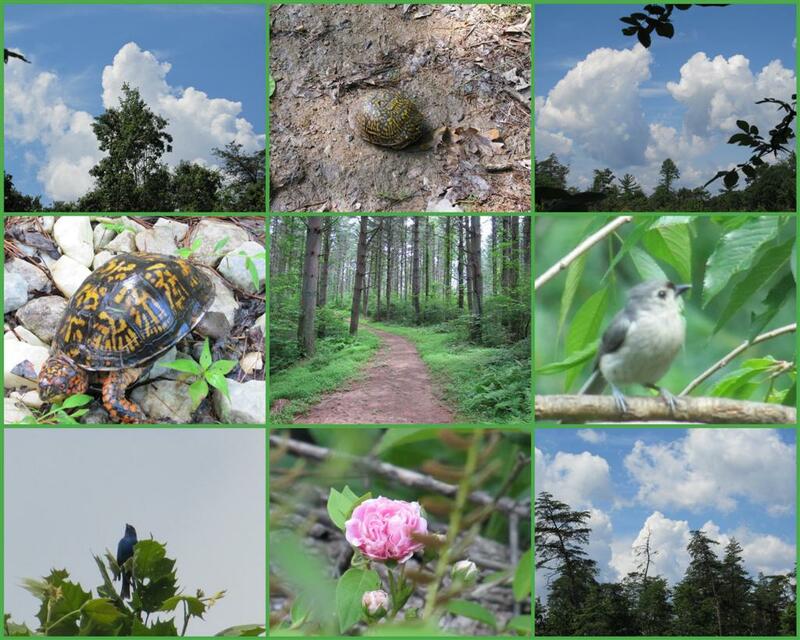 clouds and BOX TURTLES!! turtles & wolves are my animal totems!! and that Box Turtle is gorgeous...well, aren't they all?! That turtle is outstanding!! Boom & Gary of the Vermilon River, Canada. Such a pretty and colourful turtle. Compare to yours, ours are quite dull. Great colour on the indigo bunting. Good to see how involved you are with the survey. A very laudable project. So informative and educative. You are doing a great job. Hi There, So glad to get home and back to blogging. We did have a fabulous trip--but home is pretty nice also!!!!! Great collage and pictures, Eileen.... Glad you helped with the study. I always worry about the birds--and all of the wildlife when they lose their 'homes'. I am always amazed at your knowledge of birds. The study you are helping with sounds very interesting. I love your shots of the turtle. Wonderful photos! I like that little turtle. The yellow markings on the tortoise looks like Chinese characters. I enjoyed going along on your walk, and especially seeing the indigo bunting. I've only seen that bird twice. Last year I saw one box turtle, the first in ages. We see snappers and painted turtles from time to time too. Nice blog you have here.